Or how to use up not-crisp-enough-for-salad-veggies in the fridge! It’s definitely that time of the year again. It’s time for me to be predictable and moan about the Delhi heat. About constantly wanting to eat meals which are easy, quick and (preferably) chilled! I was told (more than) once by a friend that drinking iced coffee (or other chilled/icy beverages) in the summer makes you feel hotter. Rather, a hot cup of tea/coffee is more refreshing. But I just can’t buy into that. I abandon all forms of hot tea/coffee and out comes my big 2.5 litre jug with iced coffee concentrate and another one with iced tea. Spending a whole hour in the heat of the kitchen holds absolutely no appeal for me right now and I’m always looking for ways to do jugaad and get out of it. Apart from Gazpacho, I’ve never actually had cold-soup in any other form until quite recently. I was visiting my brother in Lausanne earlier in April and he had a raclette afternoon so I could meet all his friends. After 6 hours of cheese, bread, meat, beer and wine, we couldn’t bear to even look at more food/drink that day. The next morning, we discovered that we had way too many cucumbers and carrots left over (and we were STILL full from the day before) so Pascale, the resident chef, decided that cold soup was the way to cool (pun intended) our tummies. He made a delicious concoction with all the salad veggies in the fridge – just roughly chop, blitz in the blender, season and serve. It was the most delicious soup I have ever tasted. And the easiest. So when I found myself staring at some wilted (but not spoiled) cucumber and carrot in my fridge 2 weekends ago, I decided to try out some cold soup for myself. 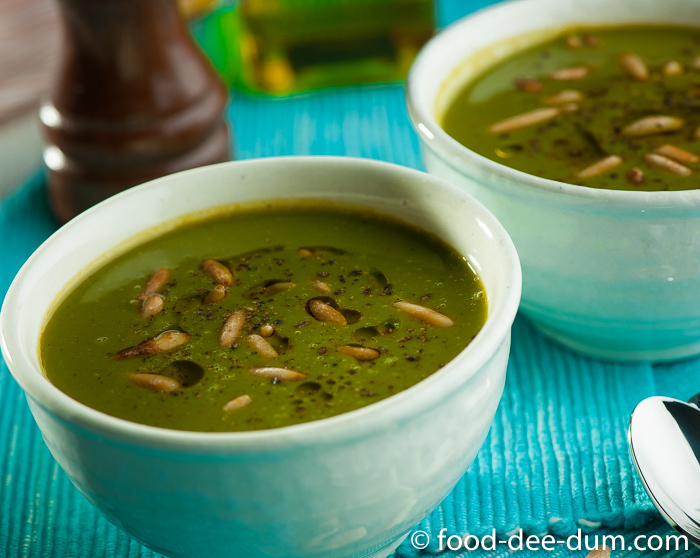 As a rule, I usually have individual portion sized containers of chopped-and-blanched spinach in my freezer for a quick addition to raita, or chana dal or something similar. So it literally took me 5 minutes to put it together. When the photo on Instagram got comments for the recipe, I decided it was a good way to break my blogging hiatus! Coming back to the point, this recipe is really the kind that works best when you make it your own. The variations, permutations and combinations in this are endless. I chose to make spinach the primary ingredient but the fun is in playing around with it. 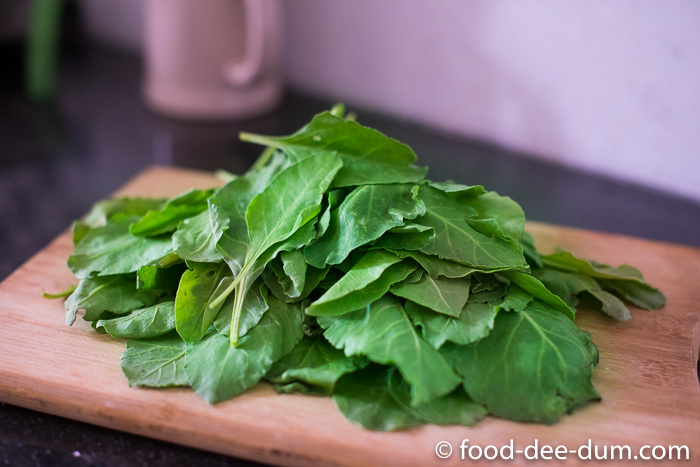 First, I cleaned and picked through the spinach to end up with the leaves and the tender stalks. Avoid the thicker, more fibrous ones. These picked leaves weighed about a 150 gms. As you can see, they’re not at their freshest – I’m so bad at consuming veggies at the right time that I find it easier just to wash, chop, blanch and freeze for the week. Mostly in the case of spinach, though. I washed and roughly chopped them. No need to exercise those knife skills as we will be pureeing them anyway. I put a pot of water to boil with a tsp of salt and blanched the spinach by dunking it in the boiling water for 2 minutes before straining and plunging it into a bowl of iced water. While this was happening, I peeled and roughly chopped the other veggies. 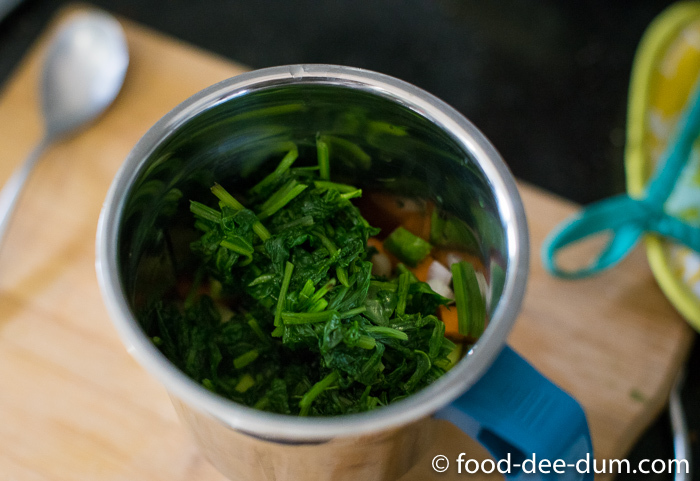 When the spinach was done, I squeezed out the water (reserving some of the icy water) and put it in the blender with the other chopped veggies. I blitzed them with a little bit of the reserved water to aid blending until it was finely pureed. Then I added the yoghurt, paprika, pepper and balsamic vinegar and blitzed again. I like yoghurt for the silkiness it brings to the texture, which is much better than using only water. If you’re planning to substitute with milk/cream, don’t forget about the balsamic which may cause curdling. Lastly, I checked for salt and added a little more water to get the consistency I liked. I poured it out into a larger container, covered it with clingfilm and let it chill for a while in the fridge. You can consume it immediately, of course, but the flavours meld together better if it’s allowed to sit and chill for a while. The flipside to this is that the colour becomes a little darker and not the original pretty bright green (thanks to oxidisation of the spinach, or rather the iron in the spinach). While the soup was chilling in the fridge (yes, I know how that sounds) I toasted up some chilgoza (kinda-sorta pine nuts) in a small skillet over low heat until they became a light brown, about 4-5 minutes. To serve, I poured it into 2 bowls, drizzled it with a bit of olive oil, sprinkled the toasted pine nuts and and a little bit of freshly cracked pepper. Voila! So go on. Try it. Make it your own. Go with more cucumber and less (or no) spinach, or the carrot-ginger route. Or roasted peppers. Add herbs. Or don’t. Just have fun playing with this recipe. Whatever you come up with, it will be worth it. I just know it. 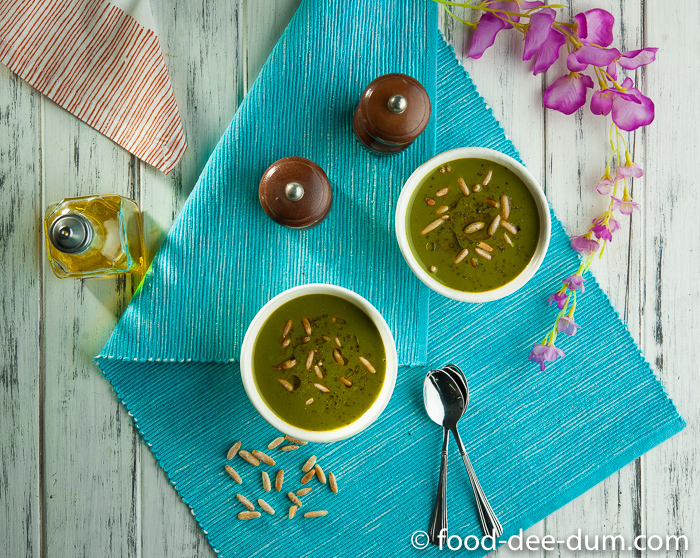 A quick and easy cold, vegetable soup. A great way to have your vegetables. 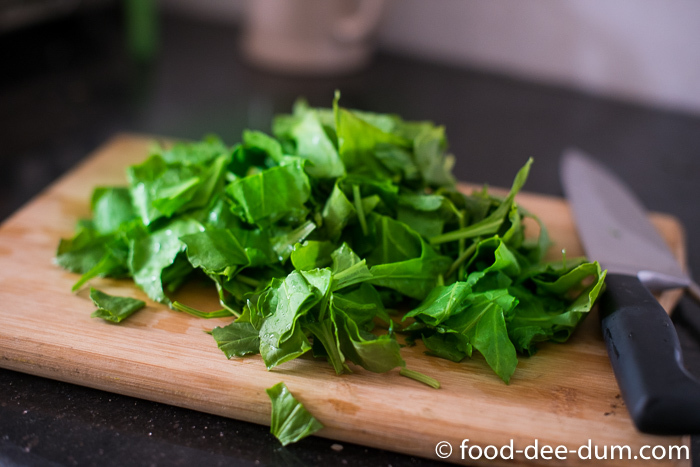 Clean and wash spinach leaves. Roughly chop them. Heat water + 1 tsp salt in a saucepan. Keep a bowl of iced water ready on the side. Blanch the spinach by dunking it into the boiling water for 2 minutes. Drain and plunge it into the iced water to stop cooking. 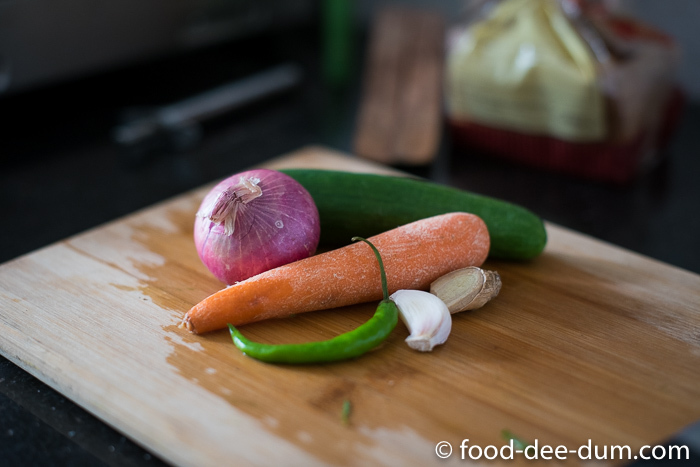 Roughly chop the other veggies - cucumber, carrot, onion, green chilli, garlic and ginger and place in the blender. 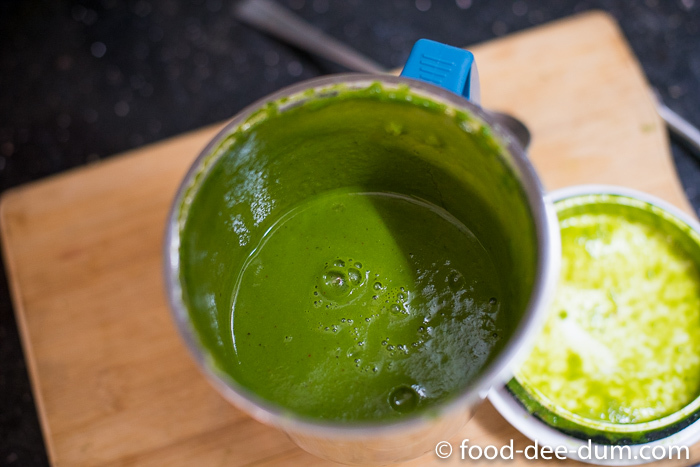 Squeeze the water out of the spinach and add to the blender. Reserve some of the water. Pulse the veggies without the water a few times and then add some water to aid the pureeing process. Once smooth, add the yoghurt, the balsamic, paprika, pepper and blitz again. Check for salt and add more iced water of necessary to achieve the consistency you like. Transfer to a bowl/container and cover with clingfilm before placing in the refrigerator to chill for an hour. 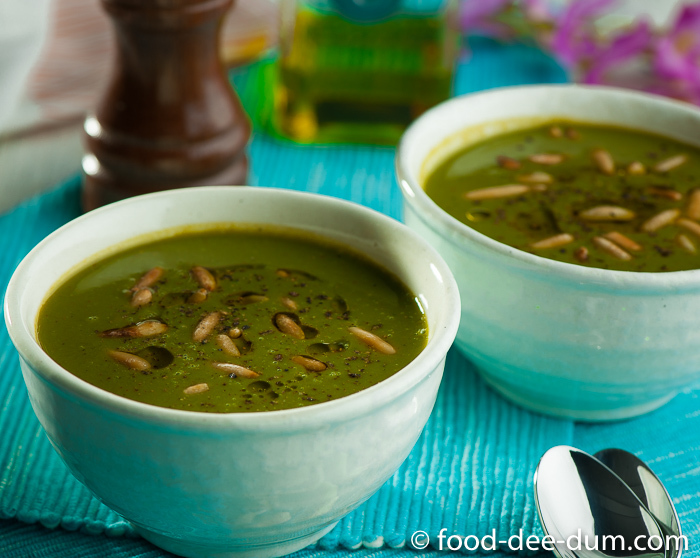 While the soup is chilling, toast some pine nuts in a skillet over low heat until they are lightly browned, about 4-5 minutes. 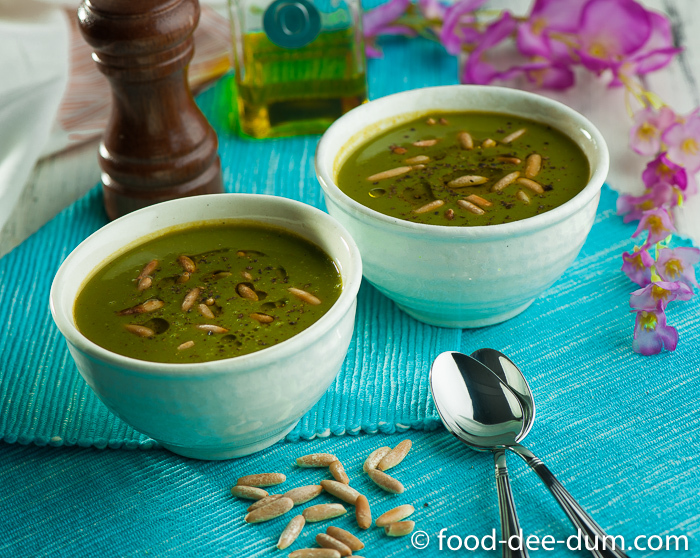 To serve, pour it into 2 bowls and drizzle with some EVOO. 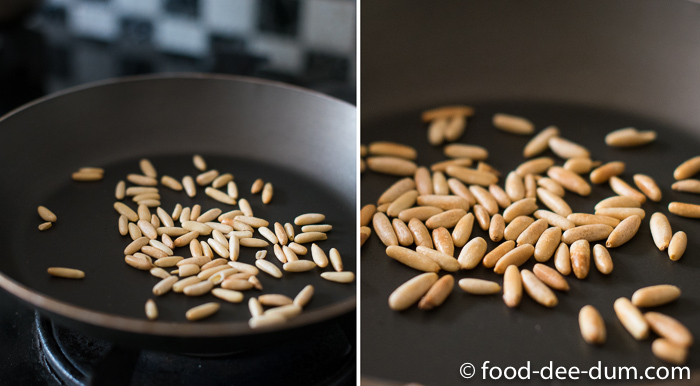 Sprinkle with the toasted pine nuts and some freshly cracked pepper.